The WebEA 'Properties View' displays a context sensitive view of a Package or element and its children. It can be enabled via the 'Properties' option in the main 'Hamburger' menu which is located in the upper right corner of WebEA. When enabled, the Properties View displays on the right side of WebEA's Main View. 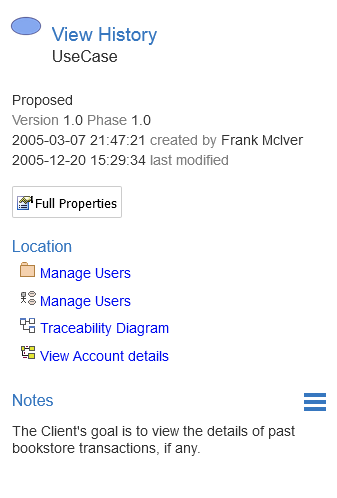 The 'Properties View' displays the principle property details of the object currently selected in the main content area, these being the name, type, notes, creation and modification dates, version and location details. By default, the 'Properties View' will also display the element Notes; however, you can select a different feature to display in this location by using the 'Select Feature' Hamburger menu (to the right of the 'Notes' heading). The main purpose of the 'Properties View' is to allow users to quickly and easily see details of elements without navigating away from a diagram. The 'Properties View' is also displayed while viewing the Full Properties of an object in WebEA's Main View. This allows you to access one feature of the element (such as Notes) in the 'Properties View' while also accessing another (such as Discussions) in the Main View. When appropriate, the Properties View will also include navigation buttons that allow you to either display the object's full properties in WebEA's Main View, or view the element/Package's children. This can be used to navigate to the object, showing its full properties in the Main View. If you have selected a Package or an Element with children, and the Browser is not currently enabled then an additional icon is displayed. This allows you to view the object's children in the object list/icon view. Within Enterprise Architect it is possible to define a number of different element types that make it easier to navigate your model (Hyperlinks, Navigation Cells, etc). By default selecting one of these objects in WebEA will navigate directly to the target (instead of displaying its properties in the Properties View). If necessary, you can change this behavior using the 'miniprops_navigates' configuration option. The Properties View is only visible if the screen is greater than 800 pixels wide. Selecting elements on a diagram while the Properties View is shown will not effect the browsing history.